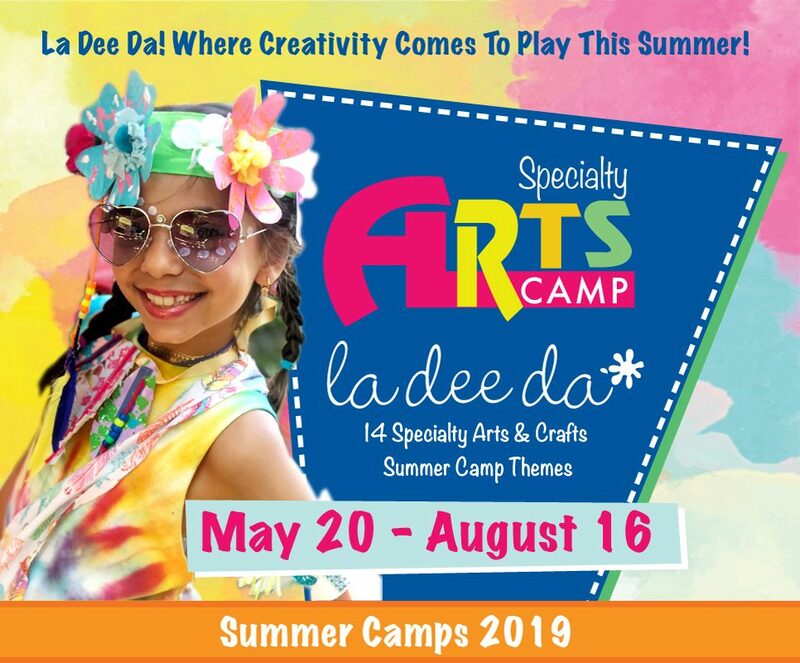 La Dee Da is a specialty arts day camp. Our summer curriculum offers 13 curated weeks that have been carefully chosen to suit the interests of children ages 3 – 10 years old. We pride ourselves on creating a nurturing camp community with attention to each individual while engaging in a group dynamic. Through a variety of fine and creative arts & crafts, yoga & movement, STEAM projects and select specialty workshops, we have created a safe and welcoming space for each camper to expand and explore their unique creativity. Our staff is compiled of real artists, early childhood educators, students pursuing art degrees and other individuals that share a love of the arts and enjoy working with children. New This Summer! SPECIAL CRAFTERNOON WORKSHOPS; 2 pm – 4 pm! These workshops are intended for children ages 5 and older and may be added as part of the half-day program or a la carte. Please see our weekly camp calendar or visit our facebook page for a list of daily projects. Campers must be a 5 years old on the first day they attend our full-day program. Join us as we kick off the summer season with a camp dedicated especially for our youngest campers. Preschoolers age 3 and up are welcome to attend. 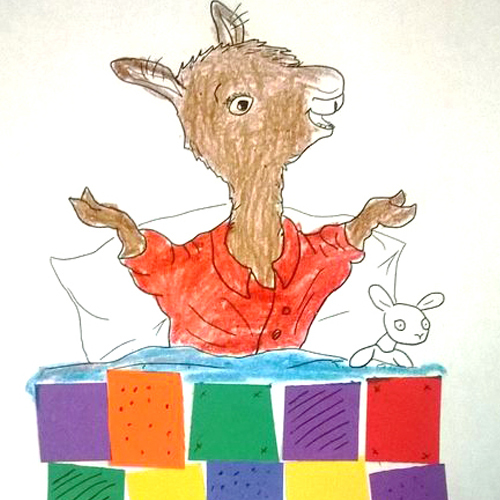 We’ll craft, make mixed media art projects, sing songs, read books and more! We’ll end the week with a fun Pajama party on Friday along with an in-house musical field trip while enjoying a special treat. Bring your favourite 18 tool and join jus for this sweet camp! 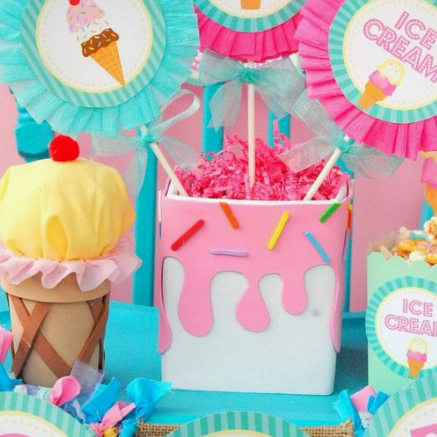 Campers will design their very own Treat Stand to take home, complete with lots of pretend French treats like cupcakes, croissants, macarons, baguettes, tarts, etc. As an added bonus, we will have a local pastry chef come in for a hands on demonstration on piping and icing skills. 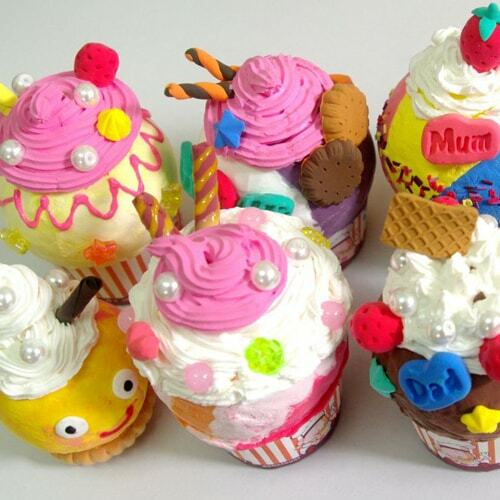 Instruction will be given on rolling fondant and making gum paste flowers. All this creating, measuring, whisking and sweetness from the week will have you going Ooh La La! 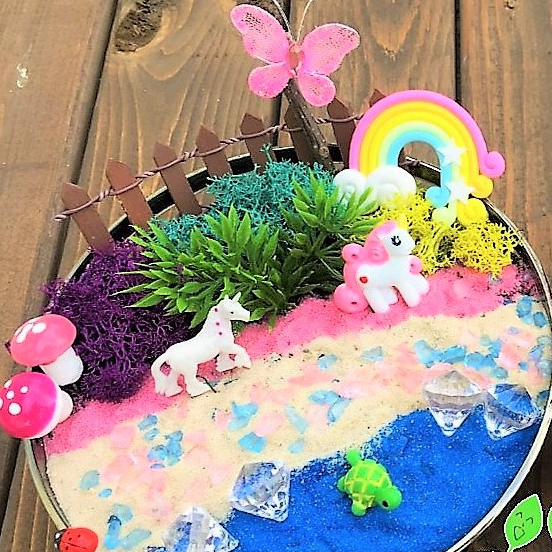 Week 3: June 3rd – 7th; Unicorns, Mermaids Narwhals, Oh My! Everything is magical and sparkly! 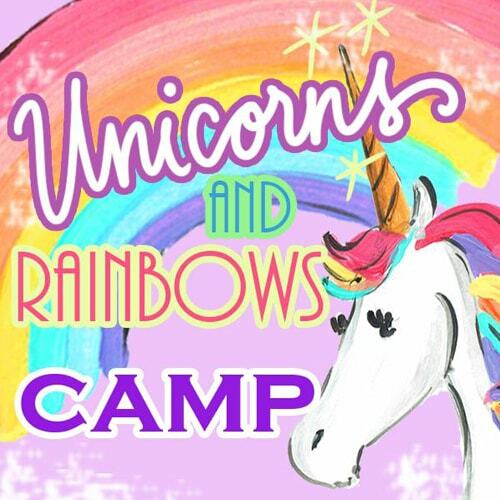 Campers are invited to explore the mystical world of unicorns and rainbows, mermaids, and the wonderfully strange and beautiful unicorns of the sea, Narwhals! Get ready for the most COLORFUL and SPARKLING summer camp ever! We will be making fun whimsical art pieces, T-Shirts and jewelery along with lots of other fun crafts that will leave mom and dad amazed! Who says scientists can’t be artists? 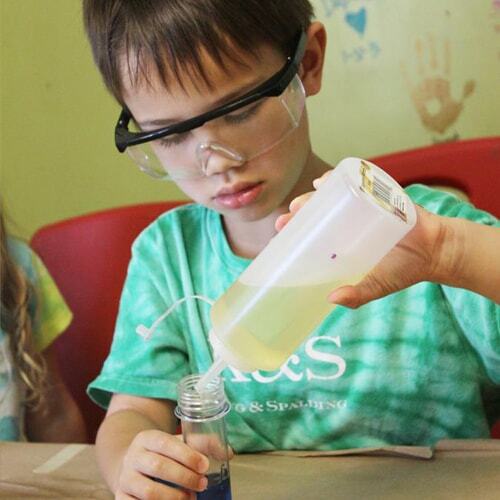 Campers are invited to become junior scientists for the week as we partake in STEM based exploration, arts & crafts, and games. We will discover cool chemical reactions, participate in a Lego building workshop, build magnetic sculptures, erupt volcanoes and create foggy dry ice storms! OR Week 4B: June 10th – 14th; A Very Merry Unbirthday Camp NEW!! Choose Week 5A : June 17th – 21st; It’s Hammer Time! Can we build it? Yes we can! Put on your hard hats and safety goggles as campers learn to be craftsmen. 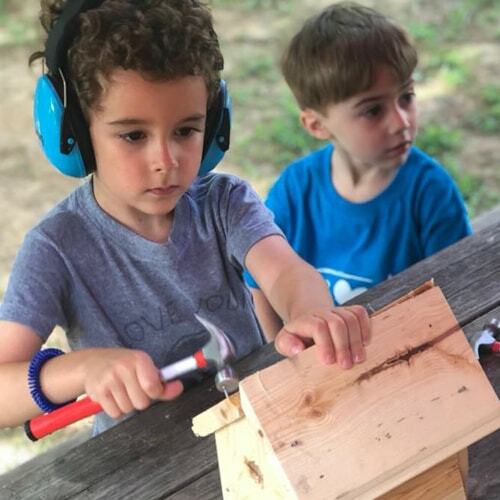 This week long carpentry camp is designed to teach boys and girls practical woodworking skills with an emphasis on the safe use of hand tools. We will learn to measure, saw, drill, and hammer while building fun projects out of wood, that we’ll paint and decorate to take home (includes our studio favourite, String Nail Art, perfect for your mantel). OR Week 5B : June 17th – 21st; Magical Fantasyland NEW!! 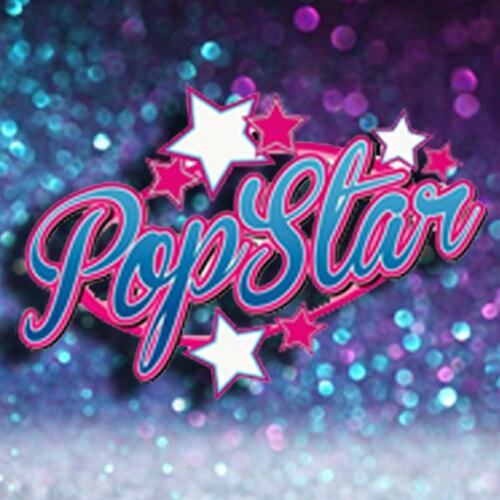 Do you love popular artists like Taylor Swift, Selena Gomez, and Demi Lovato? Do you love to sing, dance, play dress up and accessorize? 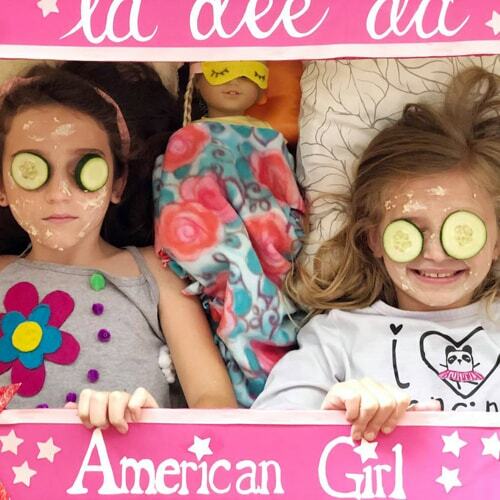 Calling all divas for this high energy, pinkalicous, twirling camp week. Join us as we learn some choreographed dance moves, make jewellery, create fashion accessories, and even show off our sparkling creations with a walk down the pink runway! WHAM! BAM! POW! Calling all superheroes! La Dee Da needs YOU! 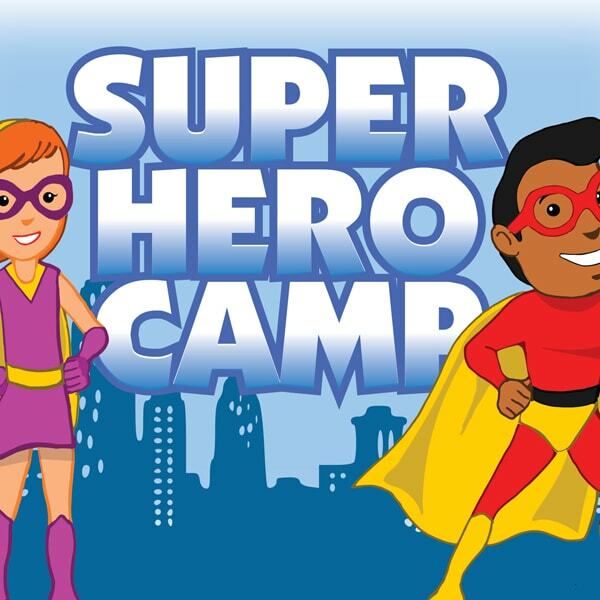 This action-packed art adventure will introduce campers to a variety of artistic styles and techniques including pop art, cautioning, painting, and more, providing a week filled with fun for crime fighters! On the last day of camp, we’ll have a superhero costume party! 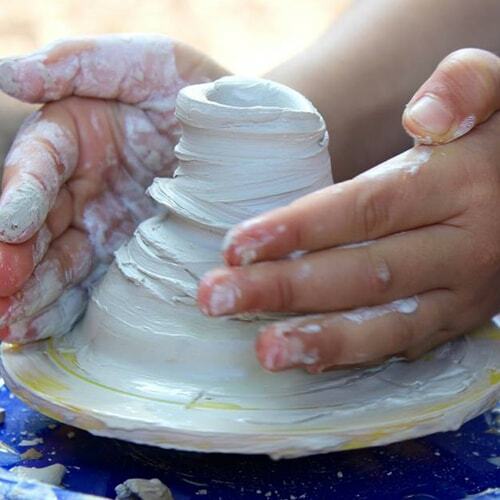 Campers will learn how to use their hands to mould and shape various types of clay into artistic creations. Projects include drawing, designing, painting, hand building with wet clay, air dry clay as well as polymer clay (sculpey). We will be creating slab sculptures, stepping-stones and mosaics. Campers will go home with several hand crafted projects like coil pots, pinch pots, clay beaded necklaces and other beautiful items. Artists will also experience working on a table top pottery wheel. 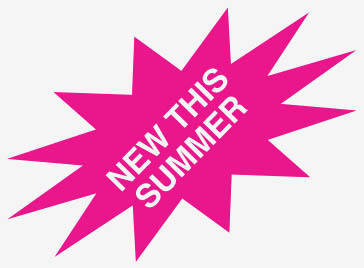 Our big kid favourite from last summer is back with a brand new curriculum! 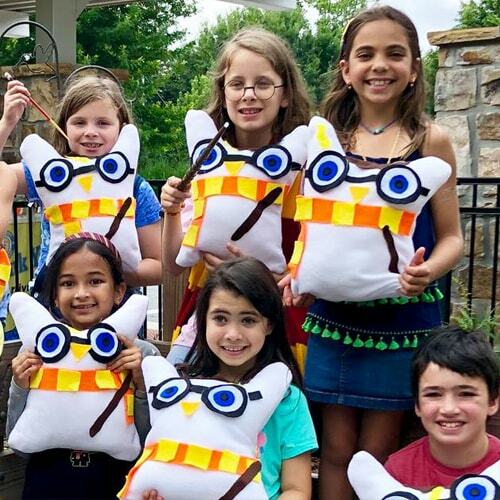 campers will get to experience many finer art techniques such as finger knitting, weaving, batik, block printing, pom-pom and tassel making along with hand painted wraps and display worthy wire nose sculptures. We will also experiment with dyeing our own fabric, using both natural and chemical dyes. In addition, kids will use a sewing machine create a pillow with their very own hand dyed fabric. You have been accepted to the School of Witchcraft and Wizardry! Join us for a week long journey into muggle studies, herbology, history of magic & potions, and the dark arts. Stay alert while we explore the amazing world of our famous friends, and of course… You Know Who!!! Projects include wand making, unicorn blood necklaces, screeching mandrakes, paper mâché wizard hats, and butter beer. Need we say more? Always wanted to be a Girl Scout, here’s your chance! Grab your favourite 18 doll and join us for a week long journey filled with fun crafts like sit-upons, friendship jewelry, kindness rocks and more. We will participate in various partner and group activities throughout the week while practicing the Girl Scout Law of being respectful, courageous, friendly and fair. 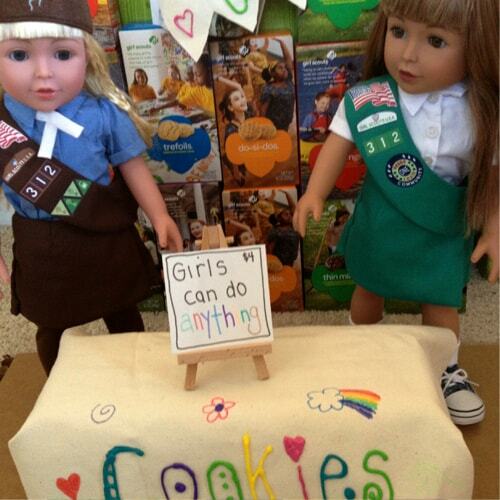 And what Girl Scout experience would be complete without cookies? As an added bonus, campers will take home their very own hand crafted cool size cookie booth! 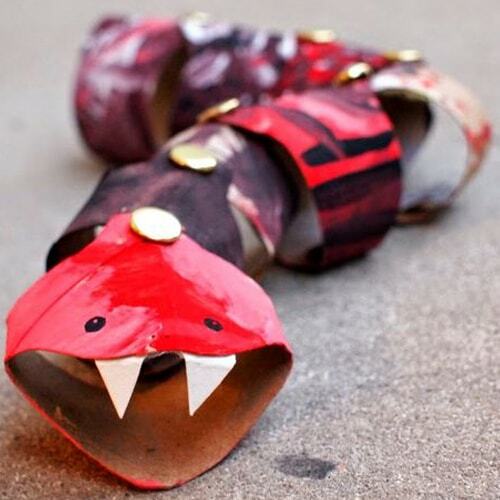 Campers are invited to crawl, hop, and slither their way through rainforests and different ecosystems. This week we will take a closer look at some of the most interesting and detailed creatures that live amongst us. We will enter a magical world where we will even use our imaginations to invent our own new type of creature. So let’s grab our art tools and get ready to cut, craft, and build animals, critters, and craft a magical environment. This camp features a special in-house reptile field trip as we go neck to neck with a 8’ boa constrictors! 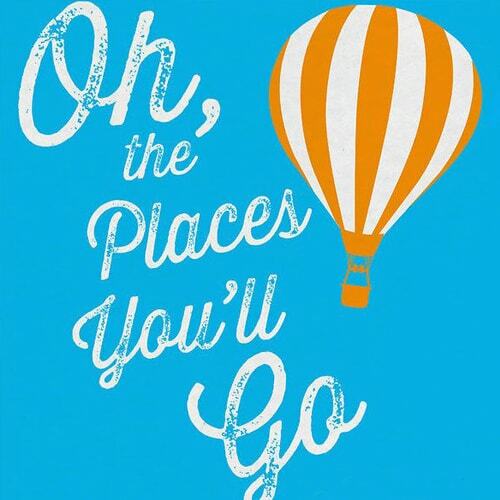 Week 13: August 12th -16th; Oh the Places You Will Go! CYou’ll be on your way up! You’ll be seeing great sights! You’ll join the high flyers who soar to great heights! Summer might be over, but we’ve still got a lot more travelling to do! pack your bags, get your passport ready, we’re headed around the world! Through arts & crafts, music and books, campers will immerse in a culturally artistic journey. We will visit a new country every day while learning about interesting styles of artwork, music, food and general cultural knowledge. Two sessions available! Cost $185 for each one week session. This weeklong afternoon workshop is designed especially for our big kids (Ages 7+). Maybe added as a full day program to the morning camp or added á la carte. Campers will learn how to use knitting needles to cast, knit and purl stitches and create a cowl neck scarf. Campers will also learn the basics of sewing on a sewing machine and create a two-toned pillow case! 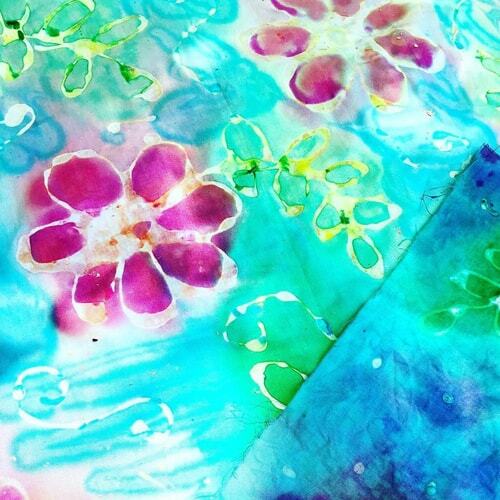 BY POPULAR DEMAND SUMMER CRAFTERNOON WORKSHOPS! (No morning sign-up needed, drop-in for a single day or sing up for the entire week!). Workshops run from 2 pm – 4pm daily with a variety of speciality crafts being offered. Must be Age 5 or older to attend. Workshops are drop-off events. Please see web calendar or facebook for details on projects. Daily rate $35/child. 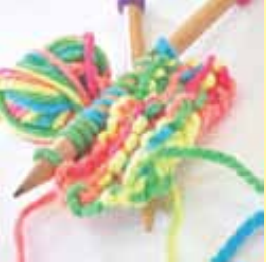 Weekly $150/child (rate does not apply for sewing & knitting workshop). Limited Space! Summer Knitting & Sewing Afternoon Workshop. Ages 7 (+); Hours 2:00pm – 4:00pm; Cost $185 (includes all supplies). Beginners welcome!